In a bowl mash 2 banana(if medium size) or use 1 banana(if big in size), then add oats flour, sugar nuts and baking powder and mix well. In a pan, add 2 tsp of butter and pour batter into a small batch and cover with lid for about a minute then flip out and until it become golden brown from another side. 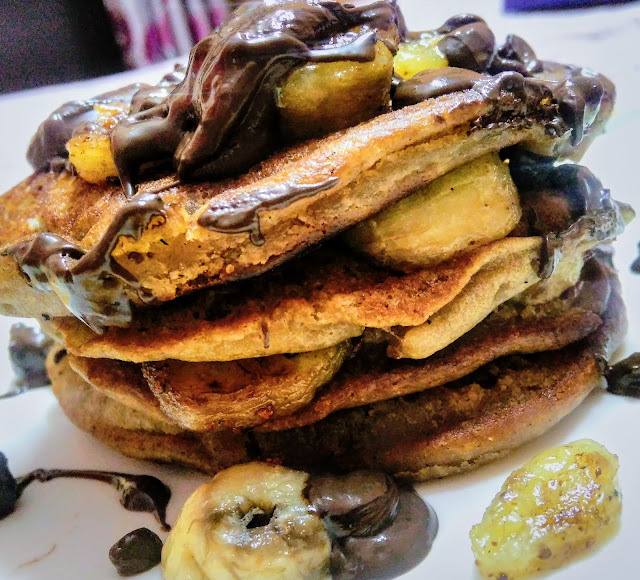 Transfer pancake in a plate, in the same pan, add remaining 2 tsp of butter and add 1 banana slice and caramelized it.Sprinkle cinnamon powder on banana. Now in a plate put one pancake tan keep few slices of caramelized banana.Repeat the same step until all pancakes are finished. On top of the last layer keep remaining slices of caramelized banana and also some roasted nuts of your choice (optional). I use chocolate sauce as my kid loves chocolate but you can use toppings of your choice like strawberry sauce or with fresh fruit. Enjoy this delicious pancake with your family. After dry cake series, I am sharing the recipe for the cup cake. 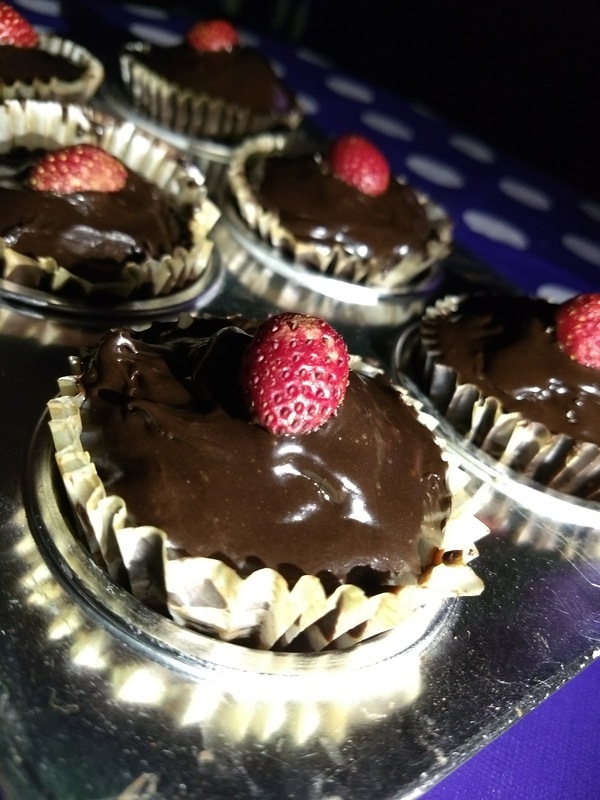 A cupcake is a small cake designed to serve one person, which may be baked in a small thin paper or aluminium cup or sometimes bake in individual ramekins, small coffee mugs, large teacups or in muffin trays. Line the muffin tray tin and keep aside. Preheat OTG at least for 15 minutes at 180 degrees in baking mode. In mixing bowl mix butter and sugar and mix in one flow with wooden spoon or whisker or a hand blender mix till it creamy and fluffy, it takes around 3 to 5 minute. Now sieve all dry ingredients maida, sugar, baking powder, soda, milk powder and cocoa powder. Now mix dry ingredients in butter and sugar mix in small batches and also mix lukewarm milk together. Now pour mixture into muffin tray and keep in the OTG for 20 minutes. After 20 minutes, check the cupcakes by inserting a toothpick or a clean knife inside the cake, if it comes clean it is done well otherwise keep again for 5 to 10 minutes. After the cup cake is done, cool it on a room temperature. 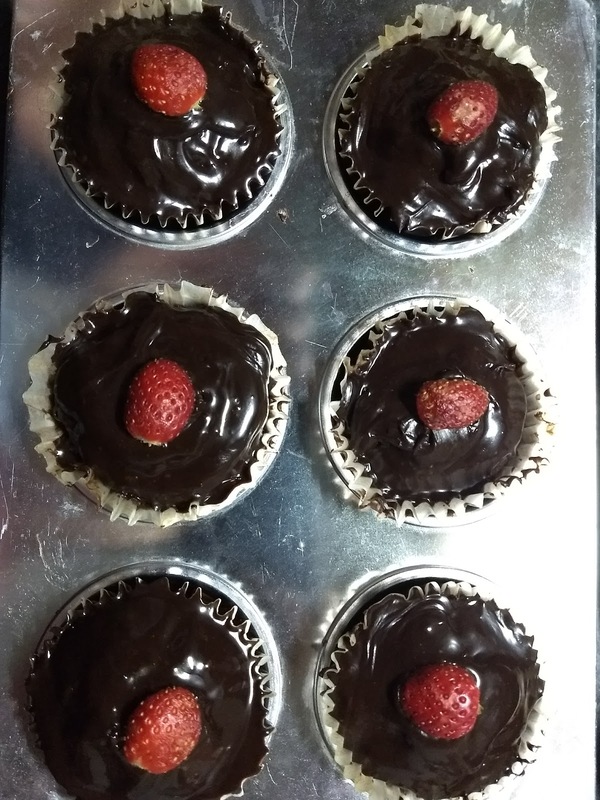 I decorated cupcakes with chocolate ganache and strawberry (on my kid demand). Dry Cake series- I share my next recipe for chocolate gooey sponge cake. 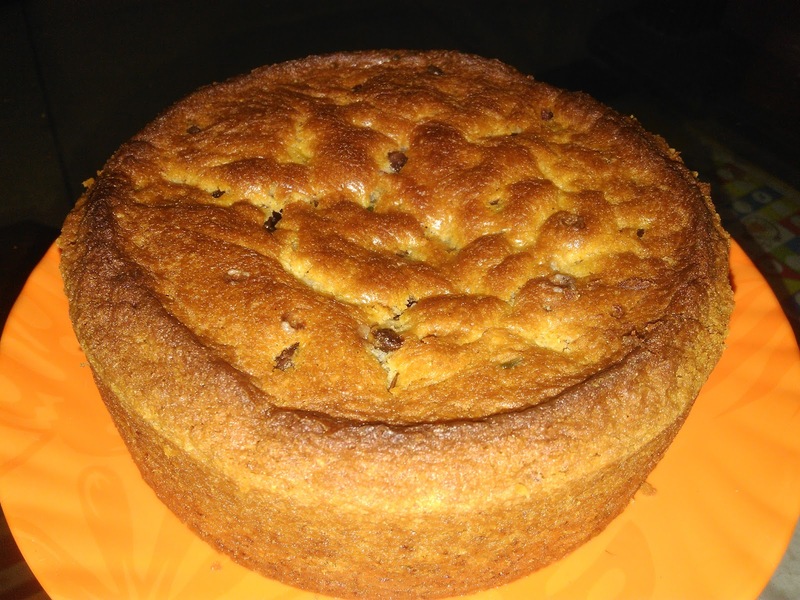 It is a very delicious cake that can easily make in an OTG or in a Pressure Cooker with simple ingredients like butter, sugar, flour, baking powder, and chocolate. Take pressure cooker with broad mouth. Put salt in a cooker and spread in a bottom and keep wire rack on salt and then keep cooker on a low flame. This is called preheat method. Now line the cake tin and keep aside. Now mix dry ingredients in wet ingredients in small batches and add melted chocolate and mix very lightly then add lukewarm milk. Finally, add tutti-frutti or choco chips in a cake mix. Now pour mixture into cake tin and carefully keep in a cooker as it too hot and close the lid without gasket and whistle for 20 minutes on low flame. After 20 minutes, check the cake by inserting a toothpick or a clean knife inside the cake, if it comes clean it is done well otherwise keep again for 5 to 10 minutes. After the cake is done, cool it on a room temperature and enjoy the cake. Preheat oven to 180 degrees for at least 10 minutes in baking mode. Keep cake tin on wire rack for 20 to 25 minutes if you want the cake to become browner from upside than keep 5 minutes more. Flour or maida can also be used to coat tutti-frutti or choco chip or any other fruit and nuts before adding to batters, thus preventing them from sinking to the bottom of the pan when packed. 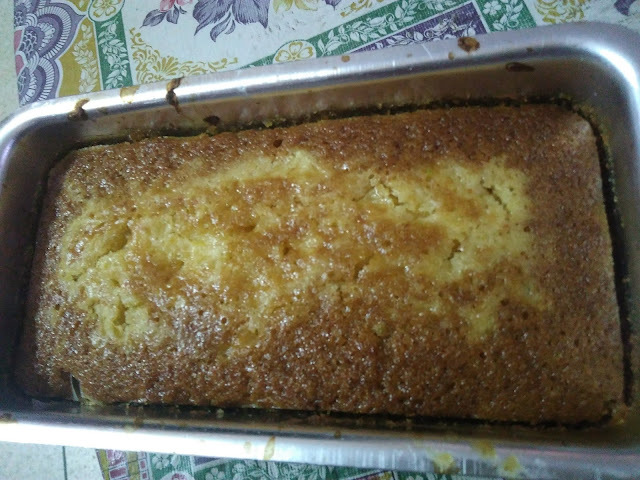 Orange Cake is a delicious cake that can easily make in an OTG or in a Pressure Cooker with simple ingredients like butter, sugar, flour, baking powder, and orange pulp or orange juice. In winter season I use fresh orange juice instead of packed juice as it tastes better. Now sieve all dry ingredients maida, sugar, baking powder and soda, milk powder. Now mix dry ingredients in wet ingredients in small batches and also add orange juice and mix very lightly all ingredients. Finally, add tutti frutti or choco chips (optional) in a cake mix. Keep cake tin on wire rack for 20 to 25 minutes if you want the cake to be extra brown from upside then keep it 5 minutes more. If you think that the colour of your orange cake is not coming out, then you can also add orange food colour which is easily available in the market. 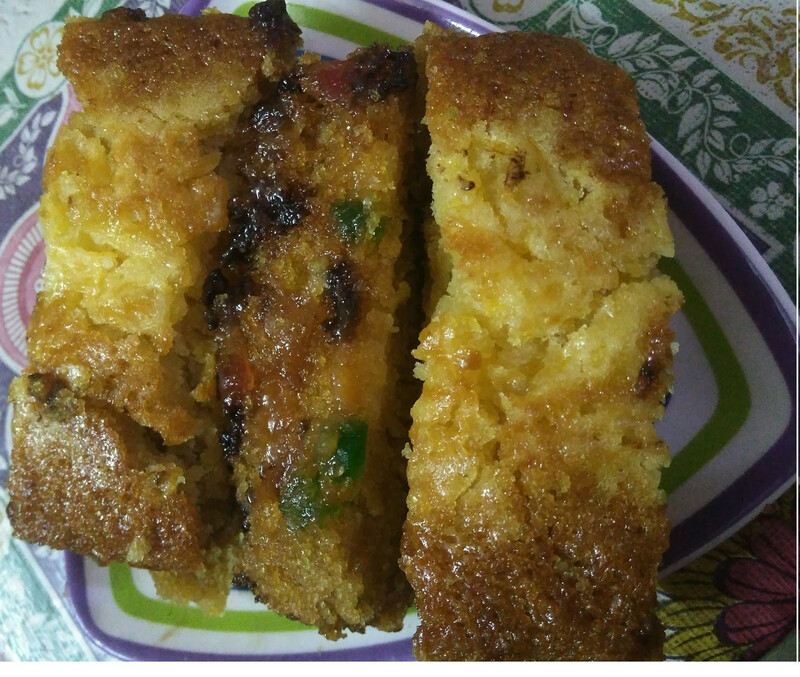 Basic Sponge Cake is a delicious cake that can easily make in an OTG or in a Pressure Cooker.The dessert is mostly relished on festive occasions especially on eve of Christmas. So, on the occasion of Christmas, I share the recipe of basic cake with simple ingredients like butter, sugar, flour, baking powder, and curd. Take pressure cooker with broad mouth.Put salt in a cooker and spread in a bottom and keep wire rack on salt and then keep cooker on a low flame. This is called preheat method. In mixing bowl mix butter and sugar and mix in one floe with wooden spoon or whisker or a hand blender mix till it creamy and fluffy, it takes around 3 to 5 minute. Finally, add vanilla essence and mix. Preheat oven to 180 degrees for at least 10 minutes at baking mode. Keep cake tin on wire rack for 20 to 25 minutes if you want cake to become more brown from upside than keep 5 minutes more. You can also use rolled oats flour instead of maida/flour. You can also add cocoa powder-25gm in above cake batter and make basic chocolate sponge cake. You can also add coffee powder-1-2 tsp(optional) in Luke warm milk, it gives mild taste of coffee in the cake.